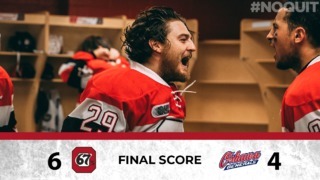 The Ottawa 67’s will skate into the OHL Playoffs with an emphatic 5-0 win over the North Bay Battalion on Sunday afternoon in front of an energetic crowd of 4597 at The Arena at TD Place. The Barber Poles went into the game still in the hunt for seventh in the standings, but despite the win, Mississauga downed Kingston keeping Ottawa in the eighth playoff spot earning them a date with the top-seeded and nationally ranked Hamilton Bulldogs with Game 1 set for Thursday night in Hamilton. 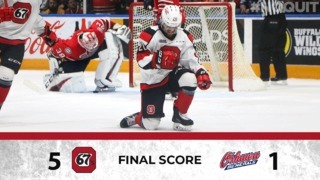 Needing a strong start to the game, the 67’s got the opening goal off sweet snipe from their leading scorer Sasha Chmelevski who cut into the middle of the ice and ripped a shot top corner past Christian Propp to propel Ottawa ahead 1-0. With five seconds remaining in the period, Tye Felhaber converted on the power play for his 30th goal of the season pacing the 67’s to a 2-0 lead after the opening 20 minutes. The 67’s kept the pressuring coming in the second firing 15 shots on Propp. Propp proved equal to the challenge, but Carter Robertson found the back of the net for the second time in three games giving the 67’s a 3-0 lead after two periods. Olivier Tremblay turned aside 11 shots in the middle frame for the Barber Poles. Despite goaltending change from the visitors in the third, it didn’t stop the 67’s attack. Tye Felhaber would score again on the power play this time at the 6:18 mark of the third to vault the 67’s to a 4-0 lead. With under five minutes to play, the 67’s would find a fifth goal through the veteran Jacob Cascagnette. Tremblay turned aside all North Bay shots for his third shutout of the season to go along with his 25th win on the year. 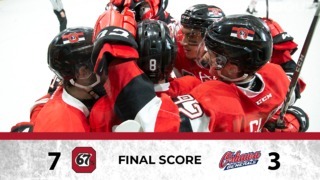 The 67’s will open the 2018 OHL Playoffs Thursday night in Hamilton at 7 p.m. Game 2 will go Sunday at the FirstOntario Centre also at 7 p.m. The series shifts to the nation’s capital on March 27 for Game 3 at 7 p.m. with Game 4 going the next night (March 28) at 7 p.m. Playoff tickets are available by clicking here, calling 613.232.6767 or in person at The Box Office at TD Place. 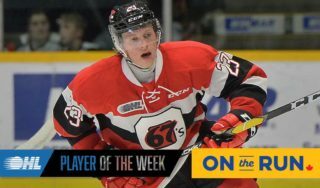 Captain Travis Barron played in his 250th OHL game. 67’s had a strong crowd for their regular season finale with 4597 in attendance. In his final regular season junior game, Olivier Tremblay posted a shutout — his third of the season. Carter Robertson ended the season on a three-game point streak after his goal today.